Saudi Aramco was looking to improve the quality of their training while simultaneously reducing training costs and boosting knowledge retention. They focused on areas where traditional classroom training does not give the hands-on experience that is crucial for learning complicated topics such as geology and facilities planning. To do this Aramco wanted to simulate their processes in Virtual Reality while giving their trainees real-time feedback and interfacing with their existing geoscience applications. Additionally, the Virtual Reality environment had to scale from running on a laptop to a 3D powerwall and an immersive Virtual Reality environment. To meet Saudi Aramco’s needs EON Reality developed a Virtual Reality Training System with three separate training applications. A rock outcrop simulator took high resolution LIDAR data and enabled the user to freely navigate and manipulate the 3D models at multiple levels of detail. The Vertical Seismic Profile Acquisition Simulation modeled basic physics and wave propagation through rocks and featured three different scenarios with fully functional equipment that mirrors the on site environment. 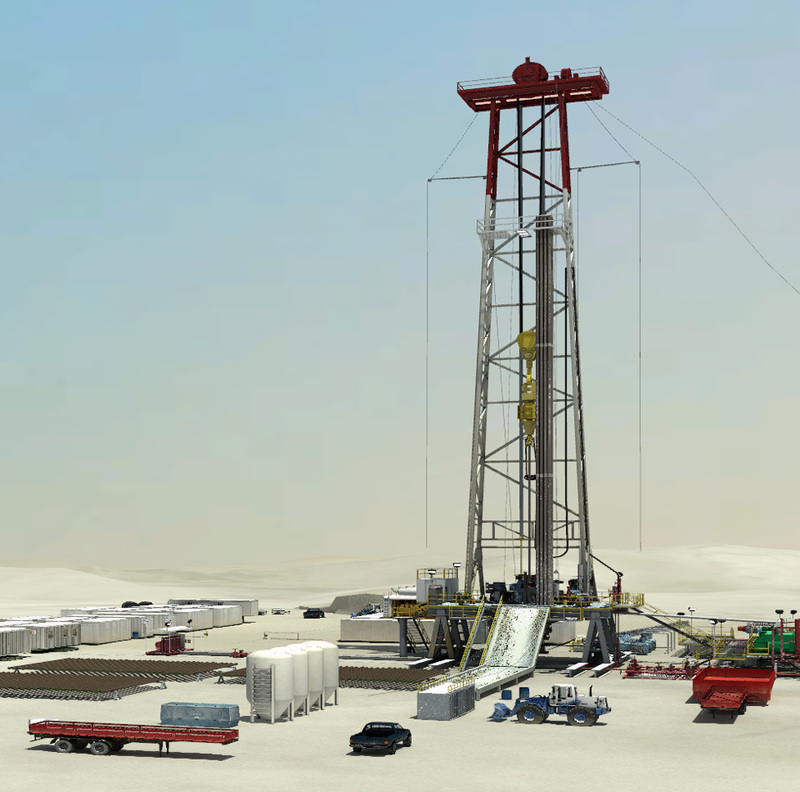 Finally, EON Reality created a planning application for Frac job sites that allowed a trainee to setup and configure the entire work site with 200+ pieces of equipment. These simulations were then displayed on EON Reality’s scalable platform letting users train on laptops, a 3D Powerwall, or the immersive four walled Icube environment. These applications improved overall knowledge transfer on how to operate equipment properly and increased the return on investment of enterprise information and engineering data. Additionally, these applications made data instantly available to a broader range of employees while bridging the language gap between expatriates and local workers through hands on learning. Dangerous or sensitive tasks can be accurately simulated and practiced. While training, employees are not exposed to potentially dangerous environments. This improved training leads to reduced accidents and improved maintenance performance. There is a significant reduction in training as classroom time can be reduced and costly travel for training can be eliminated. Personnel can make faster, more informed decisions as well as recall the information learned in a Virtual Reality environment better. The scalable platform also provides for quicker rollout than solutions that require specific equipment and allows for trainees to study on their own. The simulator proved to be a successful knowledge transfer solution for training Saudi Aramco employees by helping them understand faster, remember longer, and decide quicker.